Putting comfort of expectant mothers first, the Juzo Attractive Class 1 Cosmic Coral Maternity Compression Tights with Open Toe feature a specially woven abdominal section that guarantees a high level of wearing comfort throughout your pregnancy. Thanks to their fine and glistening knitted fabric, combined with trendy colours and the new knitted-in Vision pattern, Juzo's hosiery is a fashionable accompaniment during the event filled months of your pregnancy. Juzo Attractive Class 1 Cosmic Coral Maternity Compression Tights with Open Toe are non-returnable and non-refundable on grounds of hygiene. 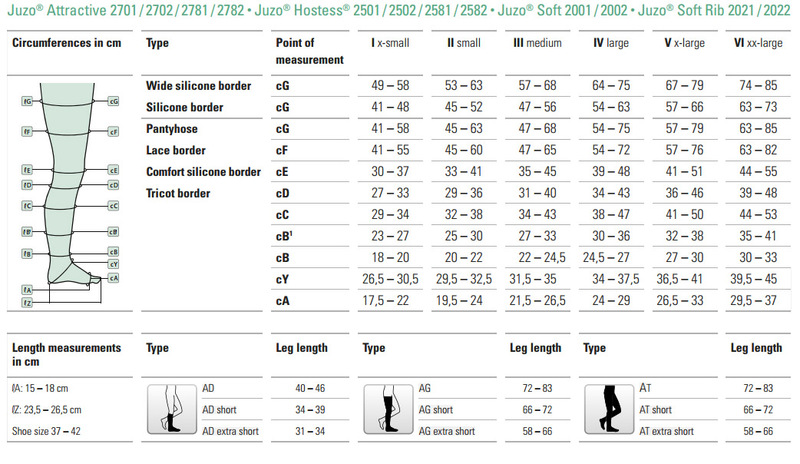 To find the necessary size of Juzo Attractive Maternity Tights, please refer to the chart below. Measure the circumference of your legs at the indicated points and find the size that is best suited for you. If your sizing is inconsistent with a single size, we would advise you to choose the largest size to ensure that your stockings are comfortable and have an appropriate size. 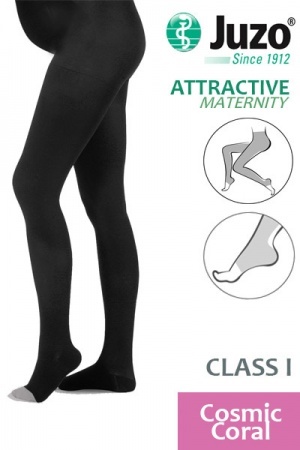 Please be aware that Juzo Attractive Maternity Tights are available in two lengths: short and regular. To ascertain which size is best suited for your needs, measure your leg from the end of your toe to roughly the top of your thigh and refer to the information below.